Some of you may have noticed either or both of the following on this blog: 1) I own a copy of a 1960s bartending guide and have not yet made anything out of it, 2) I love bourbon. My roomie finished her first final today and we’re both sitting inside being warm and cozy and I started thinking…let’s be warmer and cozier, Mad Men style. Enter: Mr. Boston’s Hot Brandy Flip recipe. I don’t have any brandy around, so I decided to use bourbon: I’ve had whiskey substituted in hot drinks before (including an awesome Hot Buttered Rye at Rye Restaurant in Williamsburg) and I thought it might turn out well. Boy was I right. 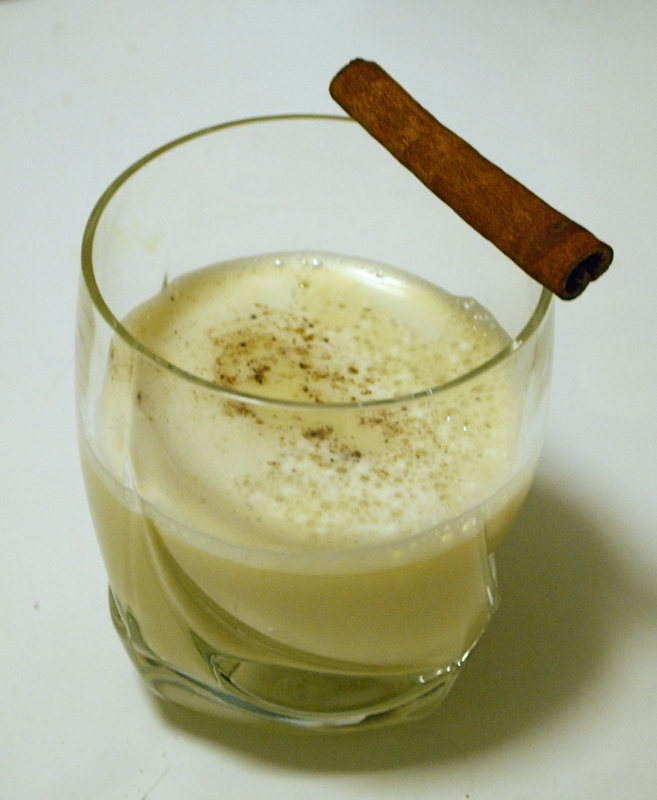 This drink is like more grown-up, boozier take on eggnog. It is the Jon Hamm to eggnog’s Justin Bieber. Yum. Shake or whisk the egg, sugar, and whiskey until frothy. Pour in the hot milk and sprinkle a little nutmeg on top. “It is the Jon Hamm to eggnog’s Justin Bieber.” – you are a genius. I didn’t realize it was this easy to make something resembling egg nog. ← Baking, Clothes Swap, and New Camera!